Adjust the oven rack to the lowest position and preheat the oven to 425 degrees. 1. Rinse it under cold water and dry it thoroughly with a paper towel. 2. Place it on a V-rack in a roasting pan. 3. Melt 4 Tablespoons of unsalted butter and brush it all over the bird. 4. Roast it breast-side down for 1 hour. 5. Remove the turkey from the oven and flip the bird using silicon oven mitts, clean dish towels, or whatever works best for you. 6. Lower the temperature to 325. 7. Continue roasting it breast-side up for up to 2 more hours. The thickest part of the thigh should register 170-180 degrees. 8. Let it sit (uncovered) for 35-40 minutes so all the juices can settle. 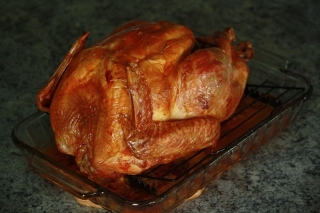 One Response to "A Perfect Roast Turkey"
Looks amazing! Thanksgiving at your place this year?